Some of our Inshore Fishing Tackle Includes, Striper Fishing Lures, Umbrella Rigs, Flounder Rigs, Tandem Rigs,Parachute Jigs, Bucktails,Fishing Sinkers, Fishing Hooks, Fishing Swivels, Jigheads, Plastic Shad Bodies, Shrimp Baits, Striper Assassins, Teaser Tails, Lure Bags, Trolling Spoons, Fishing Gift Certificates, Trolling Spread Packages and much more! Some of our Offshore Fishing Tackle Includes, Squid Bodies, Spreader Bars, Daisy Chains, Bird Teaser Chains, Aluminum Tuna Plugs, Cedar Plugs, Iland lures, Tuna Birds, Tuna Skirts. Lures for all offshore species. Tuna, Marlin, Mahi, Wahoo, and much more! FISHING PICTURES...See Some of the fish caught on our lures!! 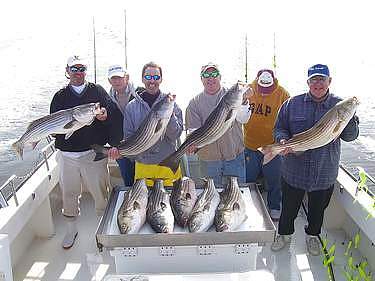 FISHING CHARTERS...Find a boat and Captain to enjoy a day of fishing. 12" Shad Bodies....These 12 Inch Shad Bodies are perfect for larger Parachute Jigs. Offshore & Inshore Fishing Tackle and Lures!! SHAD GLOW JIGS ARE HERE........ They glow up to 10 hours. In "Bucktails and Jigs"
PINK Bubble Gum SHAD BODIES ARE HERE!! UMBRELLA RIG LURE BAGS HAVE ARRIVED!! LOOK IN " LURE STORAGE" !! We have been making our own saltwater lures for years and using them on our boats for over 20 years. Most of our fishing is done in the Chesapeake Bay and the Offshore waters out of Ocean City Maryland. You can choose from our line of custom fishing tackle or from well known fishing lure manufacturers. We carry a full line of saltwater lures and tackle, If its Striper fishing the bay or Tuna Fishing Offshore, We carry the lures to give you the edge. E-MAIL US PICS OF YOU HOLDING YOUR FISH CAUGHT ON OUR LURES at CNKTACKLE@AOL.COM SO WE CAN POST IT ON OUR SITE!!! TELL US WHICH LURE YOU USED AND SIZE/WEIGHT OF YOUR FISH.!!!!! We now have the new TEASER TAILS!! You can find them in the SPOON and SPOON UMBRELLA section! These work great as trailer hooks on spoons , flounder rigs or droppers!! !